Images from the recent flyby of Phobos, on 7 March 2010, are released today. The images show Mars' rocky moon in exquisite detail, with a resolution of just 4.4 metres per pixel. 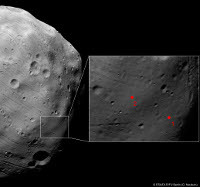 They show the proposed landing sites for the forthcoming Phobos-Grunt mission. 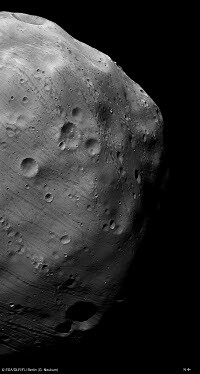 Phobos is an irregular body measuring some 27 × 22 × 19 km. Its origin is debated. It appears to share many surface characteristics with the class of 'carbonaceous C-type' asteroids, which suggests it might have been captured from this population. However, it is difficult to explain either the capture mechanism or the subsequent evolution of the orbit into the equatorial plane of Mars. An alternative hypothesis is that it formed around Mars, and is therefore a remnant from the planetary formation period. It is expected that Earth-based ESA stations will take part in controlling Phobos-Grunt, receiving telemetry and making trajectory measurements, including implementation of very long-baseline interferometry (VLBI). This cooperation is realized on the basis of the agreement on collaboration of the Russian Federal Space Agency and ESA in the framework of the 'Phobos-Grunt' and 'ExoMars' projects. Updates as the flybys take place will be posted on the Mars Express blog (see link in right-hand menu).